“BEAT: The Latter Days of The Beat Generation” by Andy Clausen. Bob Rosenthal’s insider’s guide to life inside Allen, Inc. is the book I wish somebody’d write who worked daily with Ken Kesey or Bill Graham. It’s not about any one event or even time period, but rather about how the whole enterprise worked. The David Wills-produced Beatdom book is designed in a nice large size with large print almost in double-space — like the legendary manuscripts that run through it where you could pencil in additions between the lines. It also features what I’d call “sidenotes” — like footnotes, except they appear in the side margins next to the text they relate to. They’re like a sidekick chiming in next to the main narrator, maybe a little comic aside, or some detail to add to the main narrative without actually breaking its flow. This is also like an Allen scrapbook, in a way, with all sorts of photos, handwritten notes, poems, drawings, invitations, letters, all sortsa stuff stuck in there for posterity. And its pages take you inside his life — his charity shop home furnishings and Salvation Army wardrobe; his front door keys being tossed down in old socks from fourth floor windows; the East Village neighborhood where he was a prince of the paupers; his constant juggling of ne’er-do-wells and lovers, newspapers and notebooks; and the never-ending to-do lists that were left for the author and his ever-expanding coterie of confrères. The book really took this old New Yorker and Village habitant back to the days where everything you ever needed was a short walk away and there really was no reason to ever go north of 14th Street or south of Canal. Rent strikes, squats, syringes, Tompkins Square, readings — the book’s as much a love letter to the old Village as it is to the old poet. In fact the book is written by a poet for readers who don’t want bouquets of extra words. It’s to the point. Staccato. Almost like the no-frills to-do lists Allen leaves for the author/assistant each morning — the intent & imagery clear without distraction. 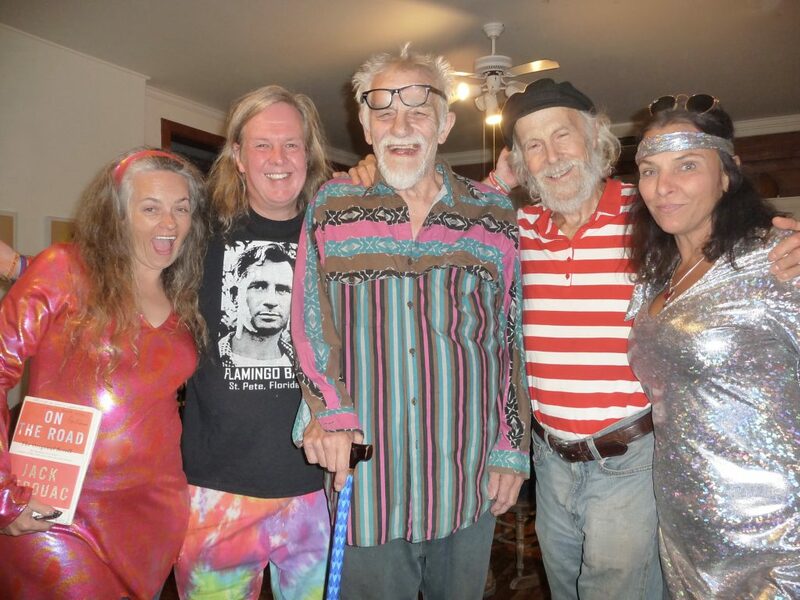 My Merry Prankster pals will appreciate that “Allen places high spiritual value on LSD,” and that he had a vial of tablets from Owsley in his freezer, with a note to guests, “Do not use without my or Bob Rosenthal’s permission.” . . . . . . Bob gives himself permission. No alcoholic, what Allen was was a workaholic. (page 70, 99, … the whole book …) “Ginsberg uses drugs to accomplish a task.” This guy & I were so much more alike than I ever knew. But glad I do now. I appreciate that Allen’s angry about some of his old friends who became neocons — something we can probably all relate to in our current surreal political nightmare. Maybe I liked the book so much because I felt harmony with so many of the observations: Disliking the liberties taken in the movie Kill Your Darlings. The details of being a caregiver to an elderly person. And that all of the author’s portraits of all the the now-deceased Beat luminaries comports with my own experience and how I portrayed them in my various books, particularly The Hitchhiker’s Guide to Jack Kerouac, about when I first met Allen and all this crew in 1982. And how Allen was always looking for the future Bodhisattva in all of us. And reading this book was like lungs full of nectar. Andy Clausen paints a much broader & more colorful canvas. Sure, there’s lots of Allen, Andy’s main cheerleader / coach / teacher / benefactor in Beatlandia, but Andy is spanning more decades, more geography, more scenes. This book is almost as much about Gregory Corso as it is about Andy Clausen. It jumps from Austin to Boulder to North Beach to the East Village faster than a speeding flip-book. It covers the giants but also uncovers the unknowns. 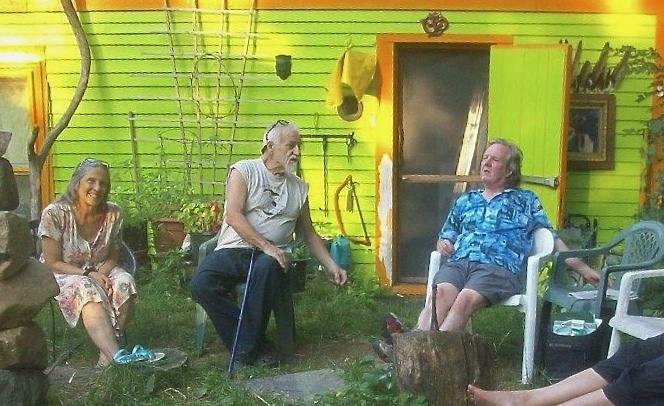 It takes you inside poetry dorm rooms at Naropa and V.I.P. party rooms at Manhattan nightclubs. It’s honestly confessional about insecurity and poverty, and speaks from experience after a lifetime On The Path. And that applies to all of us. If you’re reading this, you’re probably not the CEO of a media empire or the host of a network TV show. But you are the host of your own show — your own voice, your own actions, your own choices, the center of your own circle of friends and colleagues and co-workers and neighbors, and if you’re reading this — we need people like you. You don’t have to be a household name to be an MVP in the game. By your fruits you shall be known. And Andy knew a lot of fruits! No, I mean, he bore a lot of fruit! After some 20 books of poetry, and thousands of performances all around the world, he has finally luckily for us riffed his memoir of madness in his war against blandness alongside the grandest of the 20th century rebels. You’ll meet Neal Cassady (“He was better than the book!”), Ken Kesey (“He thought his main calling was as an acid man more than a writer.”), and Abbie Hoffman (“… percolating sharp humor and positivity.”) but mainly you’ll take a ride with a conversational driver on a cross-country Road Trip telling stories in no particular order, but, rather, naturally as one prompts another prompts another prompts another. He’s remembering lost friends (Allen & Gregory & Ray Bremser most) and sharing life lessons (how the smartest people he met knew that all people had intelligence), but mostly it’s the word pictures befitting a poet of the moments that lingered after a life well lived: Arriving at the Human Be-In and seeing tens of thousands more people than anyone expected; that afternoon spent with Neal Cassady over a kitchen table covered in “a couple of keys of Mexican” pot; reading the raw manuscript of Kerouac’s Visions of Cody. I first met Andy at the Boulder ’82 Kerouac summit and we bonded and exchanged numbers but it took about 30 years for our circles to spin in unison again. After reconnecting at Lowell Celebrates Kerouac in 2015, we ended up sharing some stages in his now-hometown of Woodstock, and he’s definitely still got “Neal Cassady’s Energy Transmission,” as Allen Ginsberg described him. “Rage, rage against the dying of the light,” another life-affirming poet told us last century, and thank the Great Spirits that poets like Andy Clausen took that to heart and continue to rage to this day. This might be subtitled “The Latter Days of the Beat Generation,” but his book and life are about a still-Beating generation of word-warriors still storming the Bastilles. Here’s where you can read about one of my books — The Hitchhiker’s Guide to Jack Kerouac. Or here’s an improvised video one-time first-thought best-thought riff to a recently fallen Last Man Standing . . .